Don't know how I missed this till now but the Panda Lun Lun at the Atlanta Zoo had twins !! They are crawling already. The zoo had a specialist come from China before the birth and they are swapping out the babies to Lun Lun so they both can survive. They are over 88 days old. From the Great Blue Herons nest located in Stanley Park, Vancouver, B.C. a new webcam. Years ago Stanley Park in Vancouver had a camera on a Great Blue Heron's nest. At that time on a previous forum we set up a topic for the nest. It was really neat to see the nest and adults tending to the chicks. It was a little precarious when there were four chicks all vying for attention from one or two adults. The nests are not that big! The cam closed down after one maybe two seasons. Today, the City of Vancouver through the Park Board announced (and carried in the Vancouver Sun paper) that it has set up a new webcam. 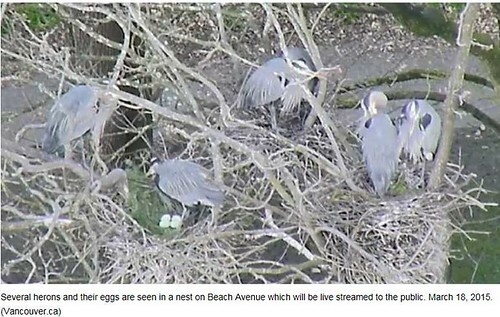 Webcam brings viewers up close to Stanley Park’s herons. Vancouver park board starts webcam so you can watch this year’s crop of eggs hatch. Directions on how to use the embedded camera are under the photo. Eggs usually start hatching in April. Thank you, BBE. It will be nice to be able to check on this heron nest from time-to-time. The Dyfi Ospreys have 3 chicks this year - and have survived rain, hail, storm, heat etc! Watch as a pair of Great Horned Owls do their best to raise a successful nest full of owlets in an abandoned eagle nest high above the salt marshes of Georgia. The ospreys have three eggs, and the first one is pipping! How cool is that? Thank you Gze.